Computer science and math are usually very exacting. However, there is one field of study known as Chaos Theory that is unlike traditional science. The idea behind chaos theory is that in large, complex systems that appear to be "chaotic," one can actually find order. Somewhere in the Amazon, a butterfly flaps it wings causing a storm in New York that manages to delay an airplane landing at JFK causing a banker on board to miss an international monetary fund meeting causing a debate on the refinance of the Brazilian national debt to fail causing the brazilian government to go bankrupt causing an election resulting in a new president who bought victory with the promise of free land in the Amazon rainforest for the slum dwellers of Rio causing one lucky beneficiary name Jorge to claim, and then clear his land in the most efficient way available causing all the birds in their acre of the forest to migrate deeper into the heart of the jungle causing two thousand starving birds to be waiting as our original butterfly is just waking up to start the entire process all over again. This time the banker makes his meeting on time. The "Sierpinski Triangle", introduced in 1916 by the Polish mathematician Waclaw Sierpinski (1882-1969), is a rather simple example of "order out of disorder." Suppose you have an isosceles triangle and on one point you write "1,2", on another point you write "3,4", and on the third point you write "5,6". Pick a point somewhere inside the triangle. Now roll a die. Now measure the distance from your current position to the corner that has the number you rolled on the die. Go half-way between your current position and the corner and plot a point. Repeat the process indefinately. Eventually, you will have an image that looks like the triangle at the left. Throughout the triangle, you can see areas that remain "untouched". If you could take any corner of the triangle and enlarge it, you would see that it would look look exactly like the whole triangle, with the same pattern of "untouched" areas—so there is some order. 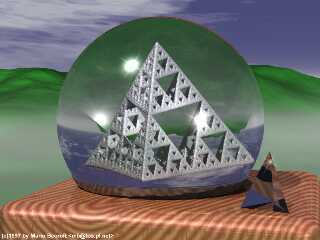 Here is some some sample code that can produce the "Sierpinski Triangle."